Ebony Bradley, who serves as program manager for American Red Cross at U.S. Army Garrison Bavaria, mans the office that services the military community surrounding Grafenwoehr, Germany. Bradley is uniquely qualified to talk about the American Red Cross and its mission in southern Bavaria, having firsthand experience of the program’s ability to bridge the gap between Soldiers and the situations they face while serving their country. 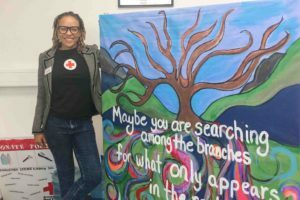 GRAFENWOEHR, Germany — Ebony Bradley is uniquely qualified to talk about the American Red Cross and its mission in southern Bavaria, having firsthand experience of the program’s ability to bridge the gap between Soldiers and the situations they face while serving their country. She is one of only three paid American Red Cross staff who cover the four bases that comprise U.S. Army Garrison Bavaria. Director Kelly Clark in Vilseck, Amanda Burrell in Hohenfels and 125 volunteers are also on the team that ensures the organization achieves its mission. Bradley has a love of running, and the stamina that accompanies it, suits her position as American Red Cross program manager. The highlight of her running career was in October 2015 when she ran a marathon in Kuwait sponsored by the Army. Bradley finished the grueling course in l hour and forty-five minutes. She has been associated with the organization since early adulthood. In addition to a deployment in Kuwait and her time in Grafenwoehr, she also worked in South Korea. The American Red Cross is a necessary part of everyday life at USAG Bavaria. Blood drives, first aid and babysitter training, instructions on how to spot the signs of depression and suicide, resiliency training and helping to prepare meals at the USO are just a few of the American Red Cross support efforts. Another important aspect of the American Red Cross’s commitment to Service members and their families involves organizing and managing a large corps of volunteers who serve not only directly with Red Cross, but who also find volunteer positions in other parts of the military community. For spouses who seek an enriching volunteer experience and find it difficult to find paid employment, the American Red Cross is a great place to go. The organization strives to match each person with a volunteer position that targets their skills and interests. Not only are volunteers able to learn valuable skills which services the organization, they may be able to use the skills to find a paying position in the future. Approximately 96 percent of the American Red Cross staff consists of volunteers. Both managers Clark and Burrell leave this year, which means Bradley will have to rebuild the team. “We train our volunteers to be our staff,” Bradley said. Bradley was born into a military family in California, but claims Virginia her home state. “Both of my parents were in the Air Force, so there was a lot of movement. I would claim Virginia, though, even though I moved around,” she said. While attending T. C. Williams High School — the school used for major motion picture Remember the Titans — Bradley was president of the marketing club, which gave her “a taste of the business world” she said. While attending college at Virginia State, Bradley again was involved in business, working as part-time post administrator for a supplier of military goods. Bradley graduated college with a degree in business. Her initial involvement with American Red Cross was as a youth club volunteer. She began full-time employment with Red Cross in 2012. I was able to meet with Bradley to ask a few questions about her life and career. Below is a recap of our conversation. 1. In your own words, what is the mission of the American Red Cross? Our mission is to prevent and alleviate human suffering in the face of emergencies buy mobilizing volunteers and the generosity of donors. And that’s what we do well, and what we’ve been doing for over 100 years. Actually identifying ways to make military life a little better is the best part of being a program manager. Engaging the military community and providing things essential to their needs. Being able to touch so many, and have them touch me back. 3. What is your favorite activity Red Cross is involved in? The Dental Assistant Training Program. It brings resiliency to family members, and it gives a skill set to family members all over the globe. All participants who successfully complete the program receive a certificate. Each participant is encouraged to check with their home state to determine what that state requires in the way of training so that each participant can more easily find employment when they return state side. 4. Where do you see Red Cross going? We have already begun moving into the idea of “one Red Cross.” We’ll have Red Cross department training so they are able to work in any section of the Red Cross with no issues. Before late 2012 and early 2013, the Red Cross was not regionalized, which meant there were Red Crosses that weren’t doing the same thing. The organization will now be more centralized. There will be cross training, so we can say we are one Red Cross. This plan is in line with President Gail McGovern’s vision for Red Cross. 5. What do you miss most about being away from the United States? Family of course. As far as living, early 2012 was the last time I lived in the U.S. So when I go home, it’s more of a culture shock then living overseas, which is funny. . . My family lives in northern Virginia and D.C.
6. In addition to running, what are some things you enjoy doing outside work? Travel. Travel is my first love. I’ve been traveling by myself since I was five years old. My mom was in Chicago, and my dad in Arizona. So, my mom just put me a plane. This was back when you told the flight attendant, and they put this button on you, and you sat up front with them and they watched you. This was before Sept. 11, 2001, and the people who were picking you up, met you at the gate. We moved all over. I hated it then, but now, you can’t stop me from moving. 7. What is your biggest challenge at work? I would say the biggest challenge comes from how many full-time staff we have. Being able to provide our service delivery all the time. We have great volunteers that supplement us, which is the only reason we can provide one half of the services that we give. So the challenge is that each year we are tasked with surpassing what we did the year before, but you don’t have any more staff. 8. Do you intend to continue to work with the Red Cross overseas? Unless an opportunity presents itself back home. 9. Is there anything you’d change about the Red Cross? I wouldn’t change our mission. As the Red Cross, we need to make sure we keep the mission at the forefront at all times. It is so easy to see a project, to see a program we want to jump on board for that isn’t mission essential. As long as we stick to this, we’ll be fine and stay around for another one-hundred years. From its modest beginnings in the 19th century, the American Red Cross has evolved into a targeted, well-run organization — perhaps the best known charitable faction in the United States and in the military community around the world. The idea that was to become the Red Cross stemmed from an incident in the life of Swiss business man Henry Dunant. Dunant observed 40,000 dead or dying soldiers laying on a battle field in Soldering, Italy in 1859. Dunant called on local people to care for the wounded soldiers. Later, Dunant introduced the concept of the need for a relief society to assist wounded Soldiers. Dunant also helped found the first Geneva Conventions, which sought to bring specific guidelines regarding the treatment of prisoners of war and health care providers caught up in armed conflicts. In 1863, Dunant and five men from Geneva, Switzerland founded the International Committee for Relief of the Wounded, which later became the International Red Cross. The symbol, a red flag on a white back ground, is the inversion of the Swiss flag. World War II demonstrated a need for the cooperation between various Red Cross societies. The organizations had attracted millions of volunteers through their efforts to help Soldiers. Henry Davidson, president of the American Red Cross, proposed forming a federation of these relief organizations, which was formally renamed The League of the Red Cross. Currently, the American Red Cross is divided into five divisions: Services to Armed Forces; Preparedness, Health and Safety; Disaster Relief; International Services and Bio-Medical. The Services to Armed Forces division has evolved into an integral part of the Armed Forces in the United States military that overseas full-time staff considered “mission essential” are authorized to live on military bases and deployable.